I was experimenting with an idea to make a dollar store pancake writer to make breakfast super fun. Towards the end of my pancake batter I decided to add some food coloring and see what would happen if I used the colored batter to add designs to the regular batter. A happy face seemed the most obvious and fail-proof. 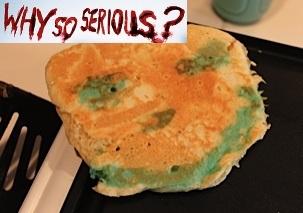 Well, once I flipped the pancake over to cook the other side, the face spread and cooked weird, and looked SO CREEPY! My little lady wouldn’t even eat it!